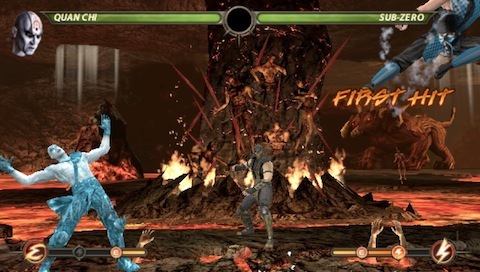 Over the last twenty years, there have been many attempts by both Midway and Acclaim to make a portable version of various Mortal Kombat games. The problem in the past was the big difference in processing power between arcade, console and the portable systems. This led to a vastly different experience from the main game in not only graphics but also in gameplay, including many missing features and playing completely differently than the original games. Even the arcade to console ports of that era had problems maintaining the same gameplay due to huge hardware differences and code having to be completely re-written for the different platforms. Here's a humorous video review of the first portable Mortal Kombat, for the Nintendo Game Boy that emphasizes how far we've come. Fast forward to the year 2012, modern mobile technology has advanced exponentially. Now mobile platforms have power comparable to their console cousins. And in the case of Mortal Kombat, its engine is based on Unreal Engine 3 which has support for both the PlayStation 3 and the brand portable by Sony, the PlayStation Vita. So when porting a game between the two platforms the end result can be much closer to each other. When I first heard Mortal Kombat was coming to the Vita, I was expecting a different game built from the ground up with lots of gimmicks substituted for the core gameplay. That is not what Mortal Kombat for the PS Vita is at all. Instead, what we got was a near direct port of the console game with almost nothing sacrificed at all and that plays exactly as its console counterpart. Plus the developers, NetherRealm Studios, even added some new Vita-exclusive content that provides hours of new gameplay for those looking for something more bang for their buck. As we said, Mortal Kombat on the Vita is pretty much the same exact game you've been playing for the last year on your console of choice. All the features you enjoyed have returned. 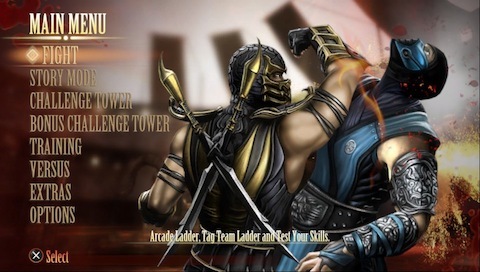 From the award winning Story Mode, Arcade Ladder, Tag Team mode, the 300 Challenge Tower missions and even all the various "Test Your ..." mini-games are all here. You can still spend your coins in the Krypt and browse your character stats and all the unlocked concept art and music in the Krypt. Let us also not forget the mode the competitive fighting game players love the most, Practice mode. Actually the only major feature from the consoles game that didn't make it over is the online King of the Hill mode. Seeing that feature really pushed the limits of the consoles, I can see why it was removed. Another minor missing feature is the online lobby & chat system, which may have been removed to make players use the Vita's built in Party system. I would have still liked to see this feature though as it made organizing events easier for people who aren't already friends. We also noticed that Kratos' stage, "Chamber of the Flame" was removed. This isn't a huge loss since it's been banned in the competitive scene due to how the stage shakes and disrupts players. 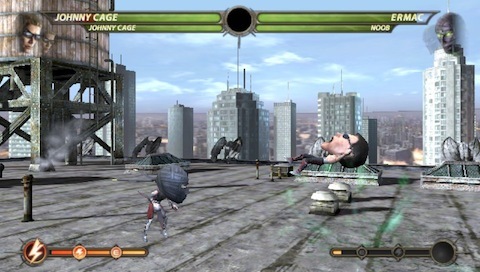 The final notable thing that changed are graphics of the game. There are necessary changes to the game's graphics due to the PlayStation Vita having slightly less processing power than the PS3. The reduction is necessary to maintain the game's expected 60fps. Most of the time the differences are not noticeable since the game runs at a blistering fast 60fps like its console counterpart. The only time the differences in the graphics are actually noticeable is when the game zooms in on a player before or after a match. Similarly, the other place it's really evident is in Story Mode where you can definitely tell when the game switches from pre-rendered console engine graphics to the live Vita engine. On the console this switching was seamless and barely noticeable to players. The overall experience I took away from these graphical changes was that during game play the graphical differences are not obvious or distracting, as you lose yourself in the fun of playing the game. On a positive note the game retains the highly detailed and lively backgrounds from the console counterparts. This is something that really separates it from the other Vita fighting games available right now for the PlayStation Vita. For instance Ultimate Marvel vs Capcom 3 uses a few static backgrounds in their Vita port. Not everyone will agree with me, but their backgrounds have a cheap feel. 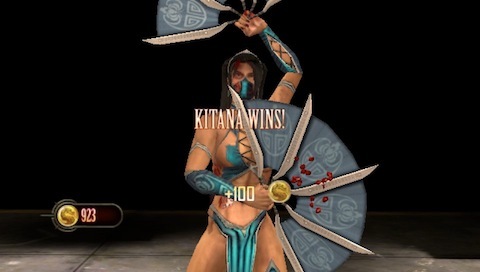 Mortal Kombat retaining their lively and moving 3D backgrounds makes this version retain the immersion featured prominently in the console version of the game. Also I�d like to make special mention to judge the game just on the basis of screenshots. This game looks great in motion on the actual Vita OLED screen. Just looking at a few still screenshots on your PC monitor doesn�t do the game justice.